Astronomers have discovered evidence for thousands of black holes located near the center of our Milky Way galaxy using data from NASA's Chandra X-ray Observatory. This black hole bounty consists of stellar-mass black holes, which typically weigh between five to 30 times the mass of the Sun. These newly identified black holes were found within three light years — a relatively short distance on cosmic scales — of the supermassive black hole at our Galaxy's center known as Sagittarius A* (Sgr A*). A black hole by itself is invisible. However, a black hole — or neutron star — locked in close orbit with a star will pull gas from its companion. Astronomers call these systems "X-ray binaries". This material falls into a disk and heats up to millions of degrees and produces X-rays before disappearing into the black hole. Some of these X-ray binaries appear as point-like sources in the Chandra image. A team of researchers determined that a dozen of the point sources in the Chandra field of view contained a stellar-mass black hole. By combining this result with theoretical modeling, the scientists think that up to a thousand of these black holes could be present around Sgr A*. 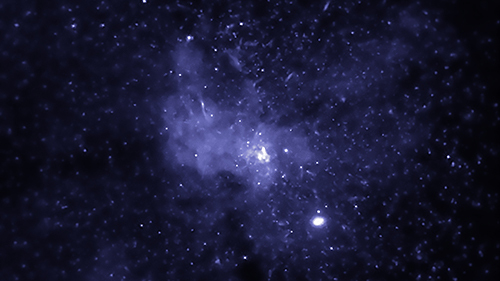 This population of black holes with companion stars near Sgr A* could provide insight into the formation of X-ray binaries from close encounters between stars and black holes. This discovery could also inform future gravitational wave research. Knowing the number of black holes in the center of a typical galaxy can help in better predicting how many gravitational wave events may be associated with them. 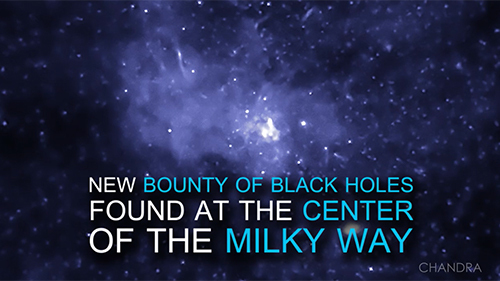 Astronomers have found evidence for a new bounty of black holes at the center of the Milky Way. These are stellar-mass black holes that typically weigh between five to 30 times the mass of the Sun. Researchers combed through data from NASA's Chandra X-ray Observatory to look for possible black holes in close orbit with a star. They found about a dozen strong black hole candidates within a very short distance of the supermassive black hole at the Galactic Center. This implies the presence of up to a thousand stellar-mass black holes that are also present, but were undetected.